Alluvium Wine Tours is a fully customized, private guiding, and education service for Napa Valley and Sonoma County. Rates are hourly based on group size and location. 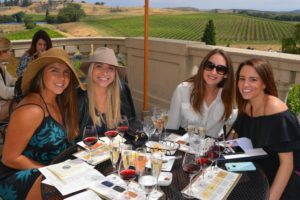 So you’ve decided to visit wine country, and all of a sudden the 900 wineries over two counties is looking a little daunting… Don’t worry, I’ve got you covered! With years of private guiding experience throughout Napa and Sonoma, I’ll make sure you can sit back and relax. My name is Holden, and I would be honored to be your wine country liaison. I have been working throughout the wine industry for my entire professional career. My passion is spending the day with people and showing them all wine country has to offer. The Napa Valley and Sonoma County have hundreds of off-the-beaten-path experiences that are hard to find, and sort through. So let’s get started! Prior to your visit, I will collaboratively work with you to plan out a unique day. A typical tour consists of four wineries and a lunch stop. Our window for tours typically falls between 10:00am and 5:00pm, when the wineries are open for tastings and sales. Drinking wine at 10:am? Don’t worry, most professionals believe your palette is actually working best in the morning! Depending on your customized itinerary, typically a tour will start around 9:45am (after a hearty breakfast), and end around 5-5:30pm. Tours are charged hourly, and entirely dependent on your drop off time. Wine tasting fees and lunch are not included. Fully insured and licensed through the California Public Utilities Commission (CPUC). My name is Holden Sapp, and I’ve been involved in various parts of the Napa and Sonoma wine industry for my entire career. As a specialist in wine guiding and education, I’d love to help you make the most of your vacation!